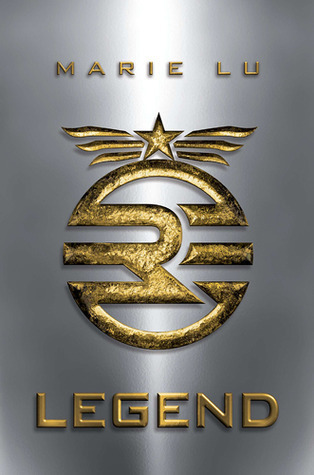 Years ago, I had borrowed my friend's ARC of Legend, then with a black temporary cover and no colored fonts. I remember being like, I don't know what this is, but DAMN it's good. I have only recently gotten a hold of this series for myself, and since it's been so long and I didn't remember much of the plot I've decided to review it despite being a reread. Legend is just awesome. Truly. The concept is one I've looked for in dystopia since the start of the genre - society divided based on intelligence. I've since seen it only in Pawn by Aimee Carter. It is done in the world of Legend masterfully, and you can't help but root for Day. As for June- she grew on me, but it took awhile. Before she rebels against the Republic I couldn't help but hate her for her ignorance despite being so smart. Granted though, she is 16 and has been sheltered her whole life, so when she starts to change and develop she becomes really likable. The romance - ehhhhhh. I was not feeling the sparks. There just isn't enough reason in approximately the week they've known each other to like each other all that much. Happy weekend! First of the school year for me. What will you be reading?